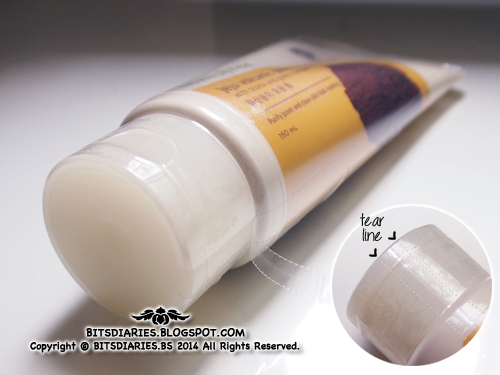 The tube of cleanser is well-wrapped with a plastic wrapper. The wrapper can be easily removed via the tear line. 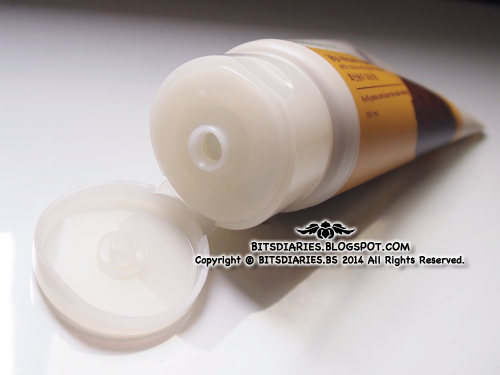 It comes in a squeezable tube with a white flip-on/snap-on cap. The opening is perfectly sealed with a foil. 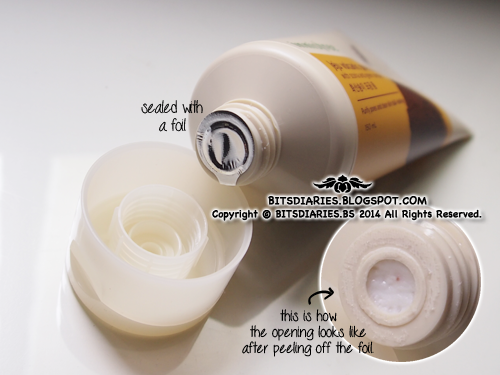 Upon peeling off the foil, the paste can be easily squeezed out from the tube. It has a nice floral scent! I absolutely love the scent! 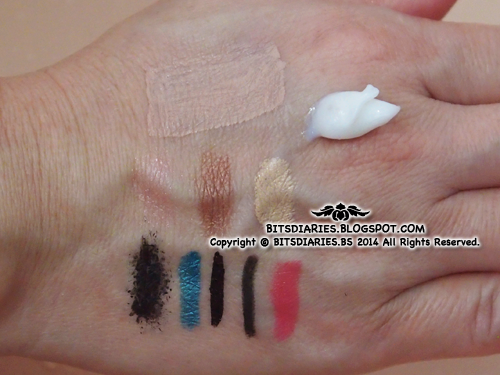 As shown in the following pictures of the Makeup Remover Test, the cleanser paste has a white creamy texture with little scrubbing beads of volcanic clusters and it lathers up well with water. 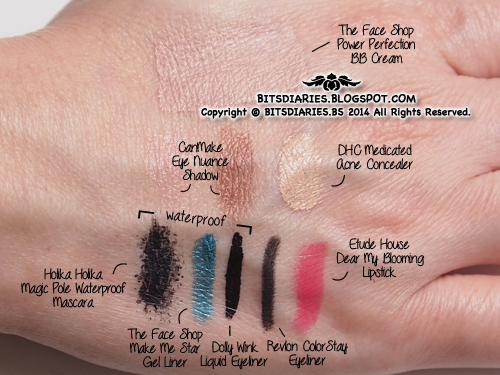 Flooded the back of my mom's hand with waterproof and non-waterproof makeup. Squeezed out an adequate amount of cleanser paste. TA-DAAAH~! My mom's skin looked brighter~! 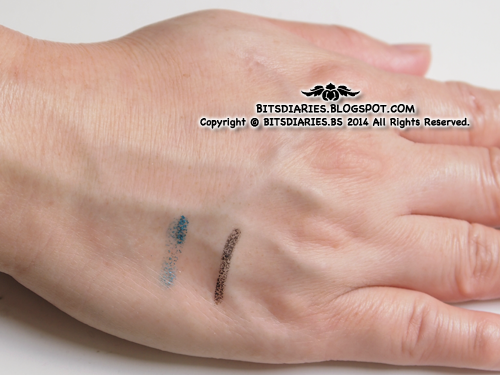 On the downside... some traces of makeup, particularly eyeliners, were still clearly visible after cleansing with this cleanser. Therefore, this cleanser does not remove all types of makeup. Well, no matter how effective a cleanser is in cleansing or removing makeup, I strongly suggest to use a makeup remover to remove your makeup prior cleansing your face with a cleanser. It's just to make sure that all traces of makeup are thoroughly removed. Before the application of the cleanser, my mom's skin moisture level was 34.7%. 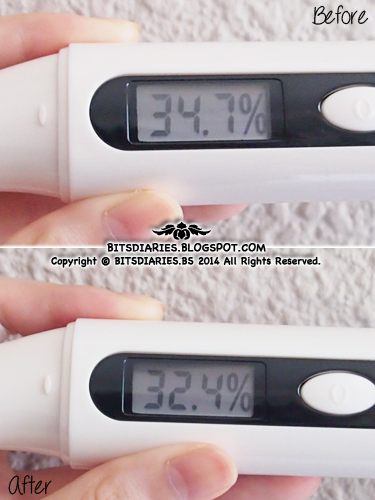 After application of the cleanser, my mom's skin moisture level decreased to 32.4%. The oil control ability of this cleanser is low in my view. For optimum oil-control results, use together with the rest of Jeju Volcanic products. 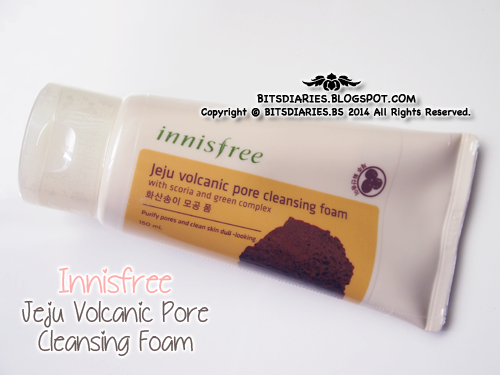 Verdict: The Innisfree Jeju Volcanic Pore Cleansing Foam lathers up and rinses off easily. It does a great job in cleansing deep into the pores, removing dirt and sebum piled up in pores and at the same time, it gently buffs away dull-looking skin cells, leaving skin squeaky clean and brighter-looking. This cleanser did not cause breakout but it dried up some areas of my skin. I have oily and combination skin (oily T-zone, dry and normal in other areas). It caused the dry areas to feel even drier (skin felt tighter). Therefore, I don't recommend this cleanser if you have dry skin. It is more suitable for oily skin in my view. 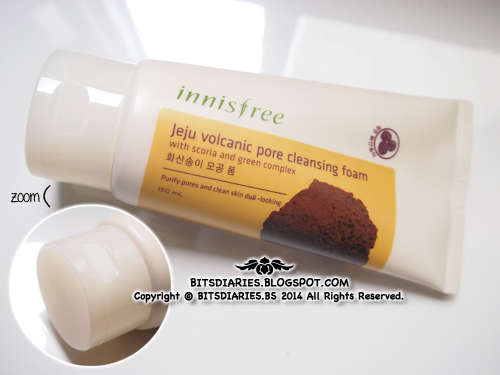 P.S: This cleanser and it's product line, Innisfree Jeju Volcanic, are intended for oily skin and pore care. [...] It may not be suitable for acne-prone skin as well, especially for skin with lots of inflamed zits. As it contains little scrubbing particles, it may further aggravate the inflamed zits. On the positive side, it works great for those hardly noticeable flesh colored bumps (clogged pores).